Griffin McMahon, the new organist at St. Andrew's Church, trained at the Juilliard School in New York. A degree from the Juilliard School in New York can help take a young performer many places: Broadway, Hollywood, dance and symphony stages worldwide. Many of these journeys start in New York City and Los Angeles, but one 2015 Juilliard graduate is launching his career on Martha’s Vineyard. 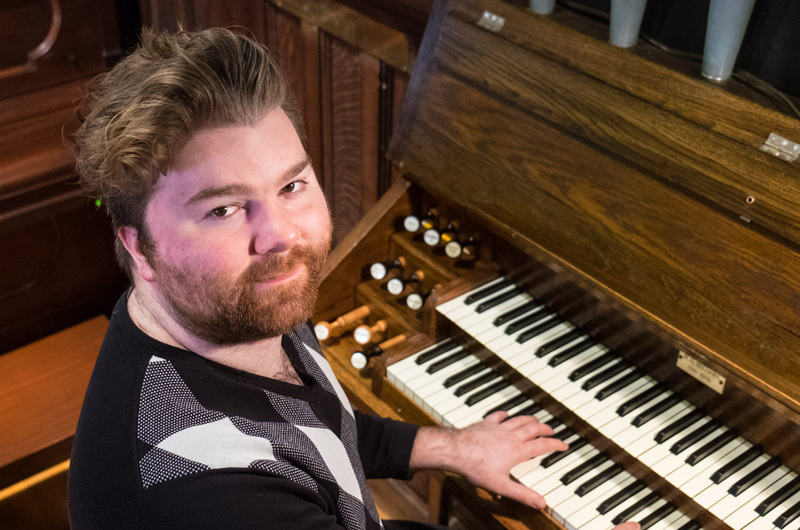 “I’m here to really put down roots,” said 24-year-old Griffin McMahon, who moved to Edgartown last year to become the organist and choir director at St. Andrew’s Episcopal Church. Dark-haired and infectiously enthusiastic, Mr. McMahon has settled easily into the Vineyard custom of holding down multiple gigs. Along with his duties at St. Andrew’s, he is the artistic director of the Martha’s Vineyard Children’s Chorus, a private piano teacher and a singer-songwriter who composes his own music and interprets songs by James Taylor, the Smiths and other contemporary recording artists. With his older brother Sean McMahon, he has performances this weekend at the Ritz in Oak Bluffs on Friday, Feb. 17 at 7 p.m., and at St. Andrew’s Church on Feb. 18 beginning at 5:30 p.m. The two brothers have played and written music as a duo since Griffin McMahon was 10, and often gigged together when both were living in New York city. “I loved New York,” said Griffin, who was born and grew up in the western Massachusetts town of Longmeadow. But after seven years of Juilliard instruction — three commuting to the conservatory’s high school program and four earning a bachelor’s degree in organ performance — he was ready to move on. After a busy summer getting acquainted with the church and Island communities, his first Island winter has been a revelation. Mr. McMahon cites Pathways, a not-for-profit performance café and gallery that takes over the Chilmark Tavern in the winter, as an example of off-season vibrancy in the arts. He recently appeared there twice, playing the piano and singing, in an evening of solo performances and another program in which he collaborated with a poet and a dancer. That cross-arts performance “is something I would have loved to be involved in at Juilliard,” Mr. McMahon said. Mr. McMahon’s own creativity finds expression in programming as well as composing and performing. 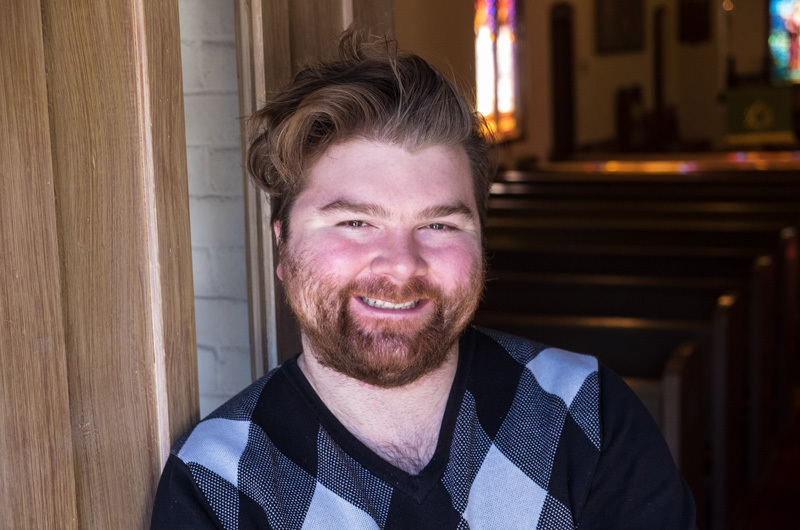 In addition to rehearsing the St. Andrew’s choir on Thursdays and playing for the traditional 10 a.m. Sunday service, he is curating a special musical version of the church’s 4 p.m. Sunday contemporary worship service once a month. “We’re trying to bring in people who wouldn’t come to the traditional 10 a.m. service,” he said. St. Andrew’s First Sundays series got underway in October with Irish traditional music, followed by jazz and gospel in November, Advent and Christmas music in December, bluegrass in January and folk and Americana earlier this month. Mr. McMahon said he is still determining the First Sundays themes for the next two months, but that more Irish music is a good bet for March. A patchwork of engagements is nothing new for a musician like Mr. McMahon, who has been working in churches and performing in concerts for more than 10 years. Slightly more unusual is the way Mr. McMahon became a professional church musician. With a Jewish mother and a Catholic father, the four McMahon kids — Griffin is the youngest of three boys and a girl — were raised outside any worship tradition. Their parents never pressed them to take music lessons either, Mr. McMahon said, but were happy to oblige when he asked to study piano and, for a while, cello. “I grew up in a very supportive environment musically,” he said. He discovered the organ completely by accident, after a cello recital at a Springfield church when he was 12. “The organist was practicing after the concert, and I thought, what is this sound?” Mr. McMahon recalled. Mr. McMahon met an even more powerful mentor a year or so later when he attended another church concert in Springfield, this one presenting Juilliard professor and Grammy-winning organist Paul Jacobs. The two met after the recital, and Mr. Jacobs strongly encouraged the 13-year-old to consider applying to Juilliard later on. “He was incredibly encouraging and kind,” said Mr. McMahon, who had never entertained the possibility of a professional music career. When Mr. McMahon did apply, and was accepted to the high school program, his father drove him the two and a half hour trip from Longmeadow to Manhattan and back each weekend. “My parents are amazing,” he said. After three years, Mr. McMahon auditioned for colleges and conservatories, winning a scholarship to Juilliard’s music degree program where he would study with Mr. Jacobs, the organist who first suggested he apply there. He also worked as a church organist on the East Side, and played secular gigs on piano and voice. Although living on the Vineyard is a long way from the urban cultural scene where he earned his bachelor’s degree, Mr. McMahon insisted he hardly misses the big city. Getting off-Island for concerts and engagements in New York and Boston is no problem, he said. Just last year, a Vineyard connection got him tickets to composer Steve Reich’s 80th birthday party in New York. “I think that’s one of the best things about being based on the Island here is that even though you have to take a boat, in the Northeast you can still get to these places pretty easily,” Mr. McMahon said. There’s currently just one thing missing in Mr. McMahon’s career: a few more voices to swell the St. Andrew’s choir, which he said is lacking in the lower sections. “A tenor or two and a bass or two would be perfect,” Mr. McMahon said. A refreshing new talent, definitely want worth the trip. What a wonderful article about Griffin McMahon, the great programmes of music at St. Andrew's Church and Martha's Vineyard. I would like be to retire there and get involved in such a community. Griffin gave some impromptu & wonderful performances here in Leeds churches, St Peter's and Armley. Great article, all the best for Mr. McHahon. I look forward to hearing you play some time. I befriended young Griffin last year and heard of his plans to work and stay the winter. That in itself is a challenge. Since then I have frequently run into Griffin at a variety of venues and see that he has indeed fit himself firmly into the Vineyard fabric. What a wonderful addition to the Vineyard's eclectic and blossoming music scene. I feel blessed to have gotten to know him so soon after his arrival here and to call him a friend. Welcome, Griffin! We are blessed at St. Andrews to have Griffen. He is exceptional. The Island too is lucky. Love hearing him in other spots.